THPBlog: Campbell Timberlands planning to clearcut 12 miles NE of Fort Bragg. Campbell Timberlands planning to clearcut 12 miles NE of Fort Bragg. 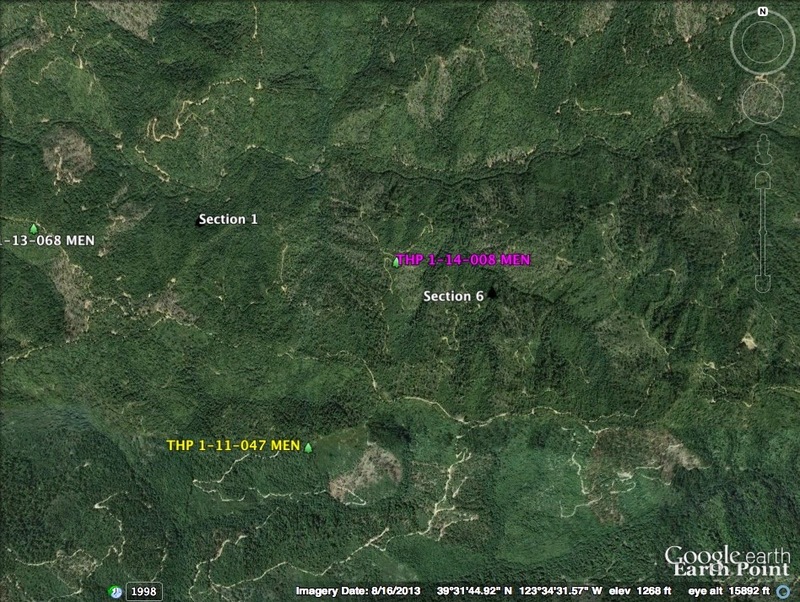 This THP is about 12 Miles NE of Fort Bragg, CA at an elevation of 800 to 1,600 feet. Campbell Timberlands is planning a tractor and cable logging operation in redwood, Douglas fir, western hemlock and grand fir forests. The THP area drains from the Middle or "Clark" Fork of the Ten Mile River watershed into the Ten Mile River which is listed as impaired for sediment and temperature. There are 20 road drainage sites planned for work including rocking and dip construction. For spotted owl site MEN0233; this THP will remove .2 acre of foraging habitat within .7 mi, and for spotted owl site MEN0484; this THP will remove 7.6 acres of foraging habitat within .7 mi. There is marbled murrelet habitat near a haul road. More information is available on the THP Tracking Center website.